The Government has lowered the minimum export price of onion by $100 a tonne to $150 tonne to boost outbound shipments that have declined. After lifting the ban on onion exports in October last year, the government had kept its MEP initially at a high $450 a tonne. Initially it was reduced to $350 a tonne and then to $250 a tonne in November, 2011, to make it competitive in the international market. But, even the lowering of onion export prices to $250 a tonne failed to perk up its outbound shipment as the commodity from China and Egypt were selling at less than $200 a tonne. Hence, the government decided to reduce the export prices to $150 a tonne. 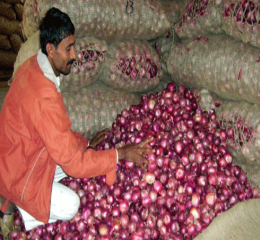 As per a notification by the Directorate-General of Foreign Trade (DGFT) “The minimum export price (MEP) of all varieties of onions, except Bangalore Rose onions and Krishnapuram onions, will be $150 a tonne”. Though, the export price of Bangalore Rose and Krishnapuram onions have also been reduced marginally to $250 a tonne from $300, the notification added.